What an absolute nightmare of a release! Ah My Goddess is one of the more popular anime series around, and as such the licences for it fly thick and fast, companies crawl over each other like crabs in a bucket trying to snare a piece of the action, and it's fans who end up grumbling about it. But, for UK fans of Ah My Goddess, it all began by making so much sense. Way back in the mists of time, AnimEigo in the US licensed the Oh My Goddess OVA episodes. In the UK, that licence fell to MVM. Then, when the feature film came to be released, it was done so in the US by Geneon. But once again, MVM picked up the release rights in the UK. It was exactly the same situation with the Adventures of Mini-Goddess, and when the TV series proper was finally produced, and licensed in the US, this time by Media Blasters, it wasn't much of stretch to expect MVM to continue to keep the Goddess franchise under one roof. You'd think that the second Ah My Goddess TV series, Flights Of Fancy would develop in much the same way, but unfortunately its release came during the inflated overpriced anime licence period of the industry, and Media Blasters lost the bidding war to ADV Films. It doesn't sound like much of a problem, you'd hardly notice the change in logo on the spines of your DVD cases, but this was also the year that the bottom fell out of the anime market. ADV, in order to subsidise their acquisitions entered into a finance agreement with a company called Sojitz, and Ah My Goddess was one of the titles acquired under the auspices of that agreement. That's the agreement that so spectacularly fell apart in the first half of 2008. Fortunately for US customers, they managed to get all six volumes of Flights of Fancy out before this happened. Not so lucky for UK customers, as AMG S2 was one of ADV UK's big releases for the year. They managed to release just one volume before the well dried up. It was better news for US anime fans, even though ADV titles were quickly getting scarce on shop shelves. 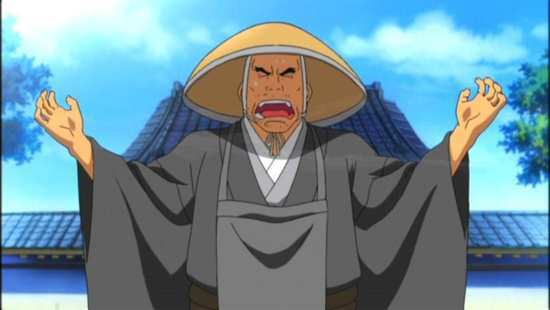 In the summer, Funimation acquired all the lapsed Sojitz licences and set about completing series and announcing boxsets. Since Ah My Goddess S2 had been released in its entirety by ADV, regardless of how hard it was to get the discs, Funimation decided to go straight to boxset, which they released in December 2008. The bottom line is that I should be sat here watching this series on 6 Region 2 ADV UK discs right now, instead of the four discs of the Funimation boxset. 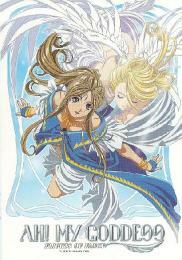 Ah My Goddess was originally the 5-episode OVA series that proved to be the hit of the nineties, as countless anime fans fell in love with the elegant charms of the goddess Belldandy. 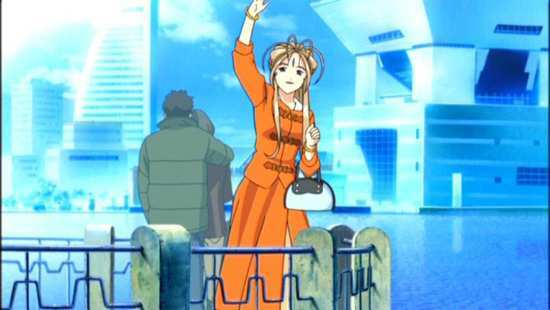 Start an impromptu poll on any anime forum, and Belldandy will rate as most people's ideal animated woman (Admittedly some think she's a wet fish, but there's no accounting for taste). A full-length anime series based on the long running manga has been a long time coming, but with the first series a major success, a second series was inevitable. Ah My Goddess takes its cue from the sitcoms of the sixties, shows like Bewitched and I Dream Of Jeannie, where an average Joe would meet the girl of his dreams, only there would be more to her than meets the eye, causing his life to change in unexpected ways. 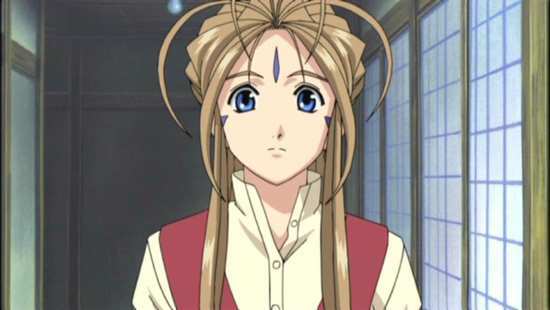 Here Keiichi Morisato is the average Joe, but Belldandy trumps the witch and genie by actually being a goddess, a celestial being who comes to Earth to grant one wish. 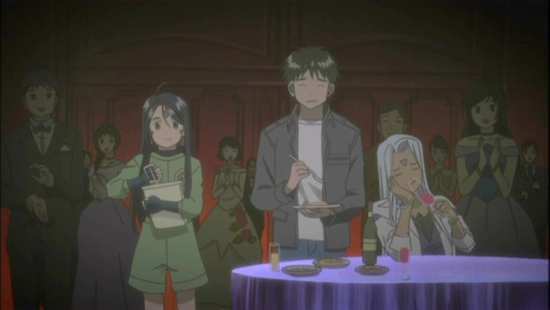 Life isn't all celestial perfection for Keiichi though, and the mayhem increases when Belldandy's elder sister Urd, and younger sister Skuld also move in. 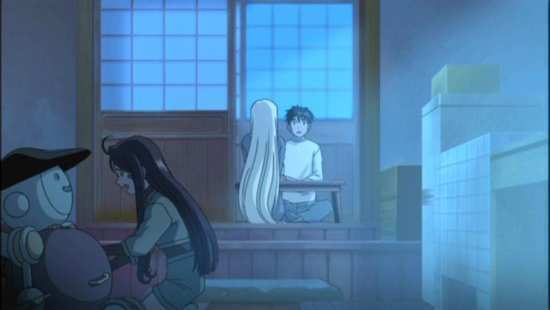 You'd think that with the Lord of Terror defeated at the end of the first series, life would get back to an idyllic bliss for Keiichi and Belldandy, as they inch inexorably forward on the path of true love, but life is never that easy, especially in a romantic anime comedy. For one thing, the all-important wish that Keiichi made gets erased from Heaven's computer system, and if he can't recall the exact wording of the wish, he'll lose Belldandy forever. Then Keiichi manages the impossible, and dials another wrong number. Soon Peorth, a goddess from a rival heavenly company is at his side, begging to grant his dearest wish. If that isn't enough, Urd's ex-boyfriend Troubadour comes to town, sees Urd with Keiichi and gets the wrong end of the stick, and unleashes some choice curses. Then Marller decides to clone an evil-Urd, prompting Urd's demon mother to pay a visit. You wouldn't think it could get much worse, but it does. 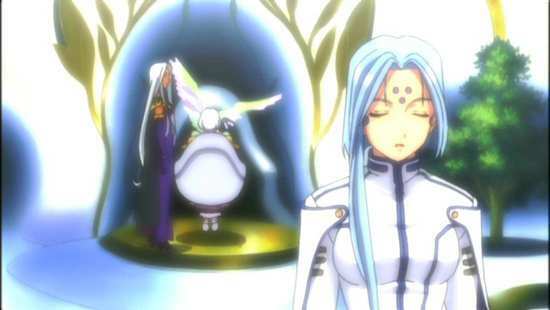 Belldandy becomes jealous, bad enough in a mortal, positively thermonuclear for a goddess. ADV's original release was spread across 6 discs, but Funimation have reorganised things, and distributed all 24 episodes across 4 DVDs. 01. Ah! I Wish… Once More! 02. Ah! The Beleaguered Queen Of Vengeance! 03. Ah! I Offer These Feelings on Christmas Eve! 04. Ah! I Want to Fill the World with Happiness! 05. Ah! Well-Matched Vibes of Love! 06. Ah! Is That Jealousy?! 07. Ah! I Shall Grant Your Wish! 08. Ah! I Want to Be of Use to You! 09. Ah! The Goddesses Go Head to Head on a Date! 10. Ah! I Just Can't Say It! 11. Ah! Grasp Your Dream With Your Own Hands! 12. Ah! A Goddess's Tears and His Dreams! 13. Ah! Let Those Feelings Awaken! 14. Ah! My Darling Cupid! 15. Ah! I'm Half Goddess, Half Demon?! 16. Ah! Shimmer Without Fear Of Darkness! 17. Ah! The Chair of Demonkind Descends! 18. Ah! Do Demons Have Any Dignity?! 19. Ah! The Love Of A Goddess Saves a Ninja! 21. Ah! Would It Be Okay If I Were a Demon?! 22. Ah! The Goddess's Confession! 23. Ah! Everyone Has a Destiny! 24. Ah! The Song of Love That Shakes the Heart! The 1.78:1 anamorphic transfer on this disc is clear and problem free to my eye. That's with the usual disclaimer about digital banding and other such niggles that are usually associated with anime. 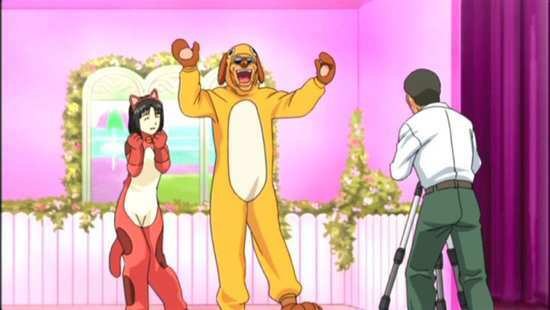 This is as good as television anime usually gets. As for the animation, especially compared to the OVA, it's a case of swings and roundabouts. 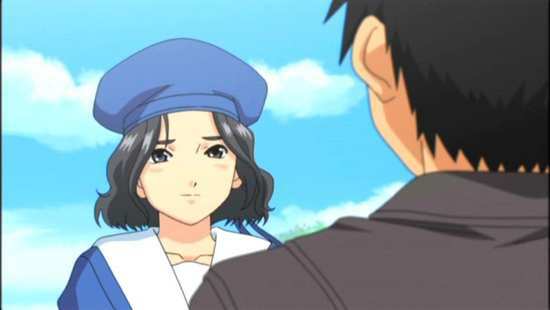 The character design and world detail is simplified in comparison to the original episodes, but the animation is much more fluid, with CGI blended in seamlessly as is the case with most modern anime. The world is also more expansive, with a lot more of the background detail filled in. Although with the necessary NTSC proviso thrown in. Also, with Funimation compressing six discs worth of content onto four discs, I found compression artefacts and such to be remarkably absent. I don't have the original single disc release to compare, but I had no complaints watching the episodes on my widescreen set. It's easy to forget that anime is usually afforded a great deal of space on a typical dual layer disc, on average only about 90 minutes worth of video, and there is usually space to spare. The same is pretty much true for the soundtracks. It's just your basic DD 2.0 English and Japanese for Ah My Goddess, with optional English subtitles and signs. I feel that the English dub sounds a little goofy in comparison to the original language track, but I guess that's a matter of personal preference. If like me, you prefer the original language tracks, it's worth noting that the original cast reunite after 12 years for this series, providing a nice degree of familiarity to fans of the OVA. ADV also pulled off something of a coup in terms of continuity, by retaining the same English dub cast from the first season. There are some more Japanese Celtic theme tunes to enjoy, and if the opener of Season 2 doesn't get you liking the sound of bagpipes, nothing ever will. It's pretty nifty, space-saving packaging that you get from Funimation. An Amaray sized card slipcase, with some very pleasant artwork holds two thin-pack cases. Each of the thin packs holds two discs, one on each face, while the sleeve artwork continues the celestial theme of the card case. Funimation may have squeezed six discs worth of content onto just four, but they have managed to keep all the extra features that were on the original ADV discs. Each of the discs gets static menus against the show's soundtrack. You'll find a Production Artwork Gallery slideshow here that lasts 4 minutes, and shows plenty of character art. 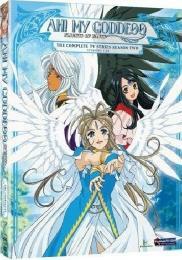 There is a commentary that accompanies episode 1 here, with Eileen Stevens (Belldandy) and Drew Aaron (Keiichi). They offer their interpretation of the AMG story, and a little insight into the ADR process. It's a nice giggly, friendly chat, but also informative. The clean opening animation is here. 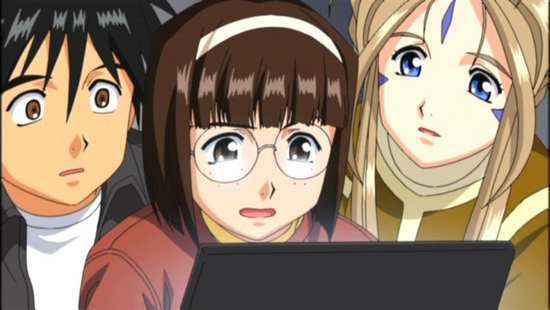 The first commentary accompanies episode 7, and features Eileen Stevens (Belldandy), and Juliet Cesario (Peorth). This is quite a special chat as way back when, Juliet Cesario voiced Belldandy in the original OVA episodes. It's interesting to compare the two actresses' take on the same character. The final commentary on this disc accompanies episode 12, and is comparatively disappointing. Veronica Taylor (Chihiro), and Dan Green (Troubadour) have something of a luvvie-in as they just turn up for a chat and reminisce. Veronica Taylor's character was in episode 11, so she doesn't have much to say about this one, and the two spend more time talking about the other anime they have done, instead of supplying us with pertinent Ah My Goddess info. 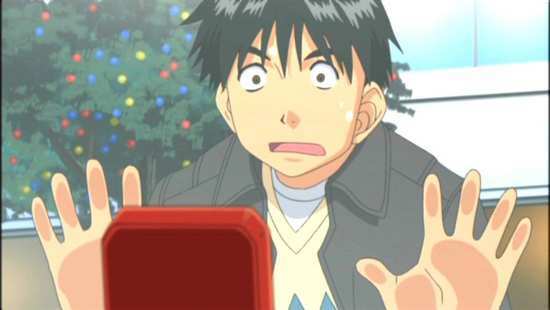 Disc 3 autoplays with a trailer for the first Negima series. Both of the clean closing animations are here. 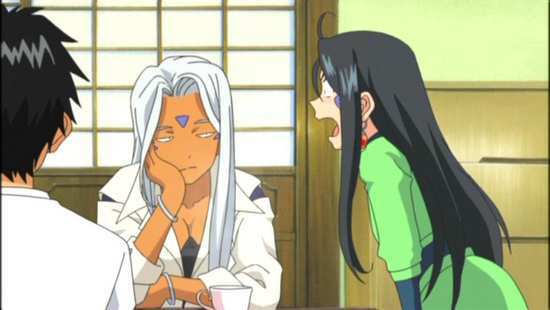 The commentary on episode 15 has Annice Moriarty (Skuld), and Vibe Jones (Urd) coming together for a chat. It starts out promisingly enough as they talk about their respective careers, but quickly turns into a good gossip about the recreational possibilities in the New York area. Not at all interesting. The commentary on episode 18 from Alyssa Brodsky (Marller) and Kevin Collins (Senbei) is a little more pertinent. They do talk about the show, their characters and compare CVs, but it's still more of a friendly chat that we are eavesdropping on, rather than a useful commentary. 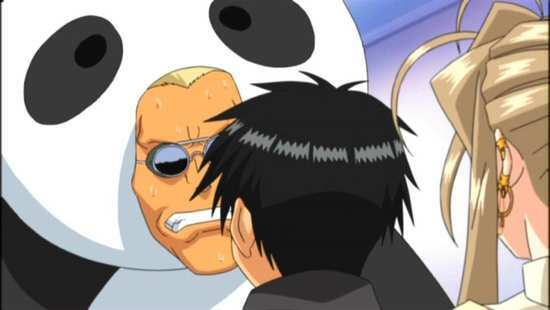 Disc 4 autoplays with a trailer for the School Rumble Season 1 boxset. You'll also find trailers for Case Closed, Black Cat, Peach Girl, Suzuka, xxxHolic, and Ragnarok on this disc. The sole commentary on this disc accompanies episode 23. It's a more useful track from ADR Director Marc Diaraison, and Voice Producer Michael Sinterniklaas, which goes more into the history of the AMG franchise in the US and the casting process. It's quite fun to listen to as well. Ah My Goddess: Flights Of Fancy is a worthy second series of a wonderful heart-warming and charming show. It's a no-brainer if you fell in love with the gentle romantic comedy in the first season, as the trials and tribulations of the mismatched goddess and hard on his luck student never taxed the emotions or ventured into worrisome dramatic territory. This is a feel good show that's sole purpose is to make you feel better about the world, yourself, and everyone else. This collection conveniently gathers all 24 episodes of sweetness and light, and presents it in a nice compact package that while it may not take up much space on your shelf, certainly delivers more value for money than its diminutive size suggests. However, much as I enjoyed this second season, I feel it's not a patch on the first for a couple of reasons. 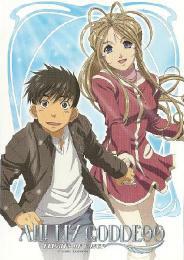 The first is unavoidable, as the strongest part of a romantic comedy is the 'falling in love' bit, and that was accomplished in the first season as Keiichi and Belldandy got together. 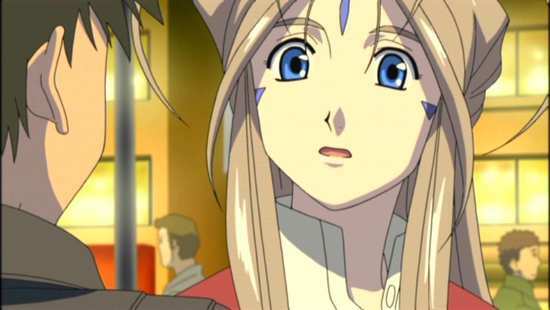 You can't cover the same ground again, at least not without time travel, so for the duration of the second season, Keiichi and Belldandy are an established, albeit chaste couple, edging infinitesimally closer each episode, and having their love tested by adversity on a constant basis. The second problem with this season, and one that could have been avoided is the lack of a strong thread running through the episodes. The first had the aforementioned courtship, as well as the Lord Of Terror conclusion, and those 26 episodes stood together as a cohesive whole. This second season is far more fragmentary and episodic, there's no real theme running through the episodes, and it's really just a collection of loosely strung together single or double episode stories, even with the introduction of a few new characters that recur. On the bright side, these episodic stories are for the most part very enjoyable. Still, Ah My Goddess is most satisfying when Keiichi and Belldandy's relationship is put to the test, which means for this season, the start and the end are the strongest, while it's at the middle that the show really begins to sag. The series starts with a touching episode where Keiichi has to recall the exact wording of his original wish, or he will be separated from Belldandy forever, who will be recalled to heaven. There then follows a couple of sweet episodes as the two try to express their feelings for each other through the medium of Christmas gifts, although adversity arrives in the form of Campus Queen Sayoko, who still has a jealousy thing going. 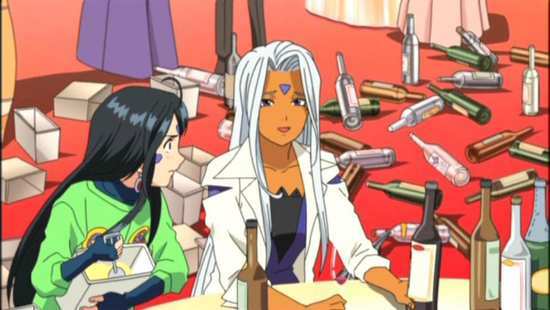 We also learn that Belldandy gets drunk on cola when chaos emerges at a Christmas party, and the first of the diversions is an entertaining one, as Keiichi's sempai Otaki falls in love, and Keiichi and the goddesses decide to help him onto the true path. The problem with the episodic nature of the season crops up when Otaki's new girlfriend isn't mentioned again in the series. 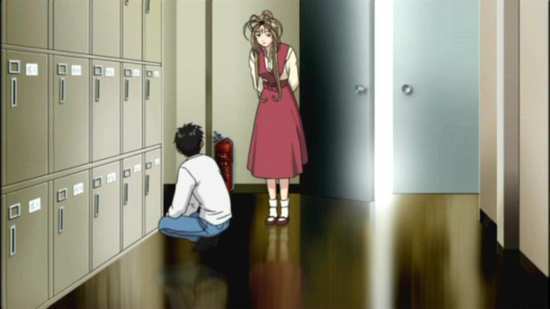 But greater continuity does take precedence, when a mysterious girl enters Keiichi's life in the next episode, eliciting jealous feelings from Belldandy, more than unseemly in a celestial being. If there is a theme to this season, it's that Belldandy has to re-evaluate her relationship with Keiichi, and what it means to her as a goddess. She's slowly taking on more and more human traits, and enjoying the simple life, but she has to come to terms with her very human feelings for him, and understand that her need to be with him can't simply be attributed to the wish anymore. This is brought into further clarity when Keiichi dials the wrong number again, and gets another wish granting goddess to pay a visit. Peorth is more brazen, raunchy, in many ways even more so than Urd, and she is ready to use her feminine wiles to elicit a wish from Keiichi. 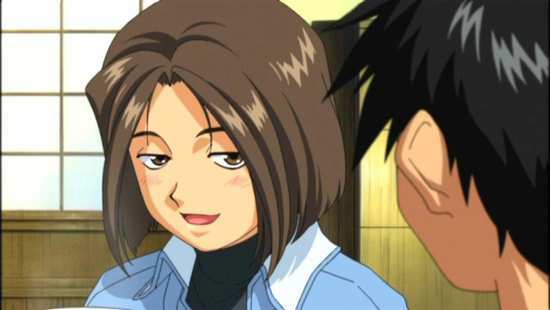 She's a rival to Belldandy, and as per anime convention, she quickly develops a fondness for Keiichi. But the bottom line is that she can see that Belldandy and Keiichi have problems even if they can't admit it to themselves. 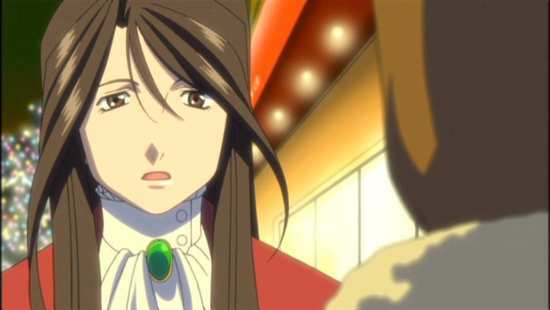 Belldandy needs to be honest with herself about her feelings, while Keiichi needs to stop being so wishy-washy and be more forthright with Belldandy. Peorth is an interesting character, and I had hoped that she would be a permanent addition to the Morisato household, but her first spell on the show lasts a mere four episodes. There is the impression though that she is more Urd than Urd, and having two similar characters in proximity for a lengthy period wouldn't be good for the story. It's around episode 11 that the show diverts attention from the central characters, and for a while it's just as entertaining. There's a nice story when the Auto Club's original leader returns, looking to find new direction in her life after achieving success with a major racing team, and the arrival of Urd's ex-boyfriend is suitably fiery. 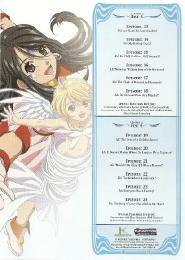 The best of the non-relationship episodes follow, with Skuld taking her first tentative steps to Goddess-hood. A goddess truly comes into her powers when she expresses her feelings of love, and in Skuld's case it means first love. For someone I considered excessively bratty in the first season, these two episodes are really sweet and enchanting, as trying to learn how to ride a bike, she finds the ideal teacher in a local boy named Sentaro. 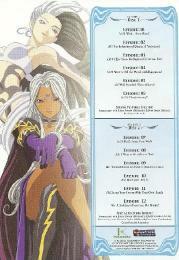 There's a hint of danger when demon Marller returns, and in a curious remake of the old Star Trek episode, Urd gets split into her good and evil halves, but Marller is comparatively defanged this time around, and her immediate boss, Hild, who also happens to be Urd's mother, is also more mischievous than malicious. 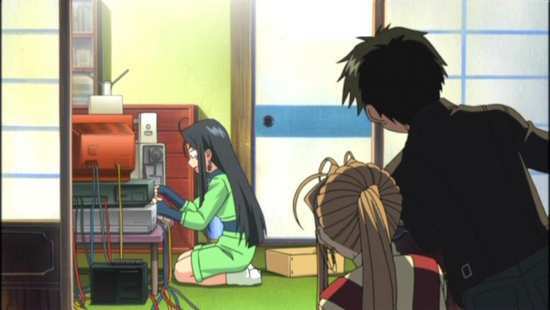 We have one remake early on, when Keiichi's hard work to buy Belldandy a ring is somewhat similar to a plot point in the Ah My Goddess movie, but the Ninja episode is the low point of the series, utterly forgettable, and the plot is lifted wholesale from a Mini Goddess episode. 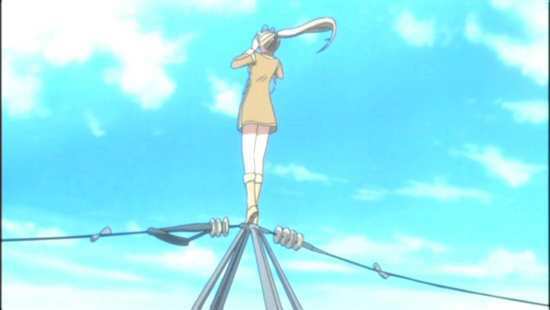 Its only redeeming feature is that it sets up the final arc by making Belldandy lose her licence. It's only for a week, but living as a human is more difficult than they expect when one of Skuld's inventions throws them into the middle of infinity. You'd think that spending eternity together in the middle of nowhere would get the two to be candid with each other, but Keiichi's dithering continues. 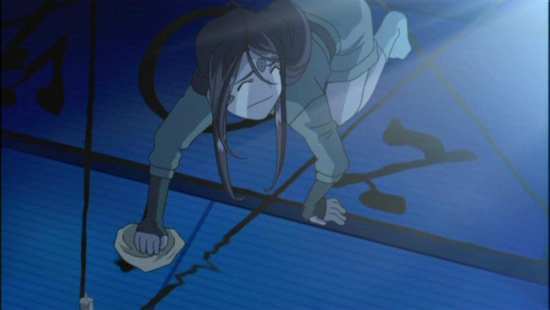 It's at this point, around episode 21 that fate throws a hockey stick into the path of true love, with first Belldandy becoming a demon, only able to ensure Keiichi's happiness by being evil, and then Hild gets sneaky and changes history, so that she becomes Keiichi's one true love. 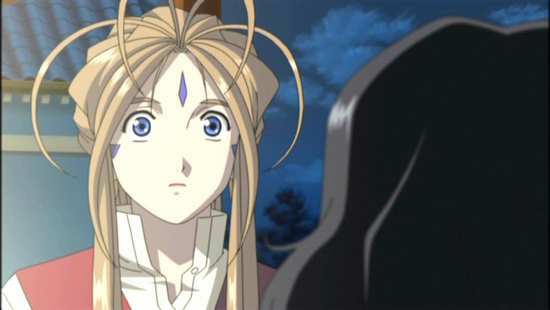 Belldandy has to travel back in time and fall in love with Keiichi all over again. 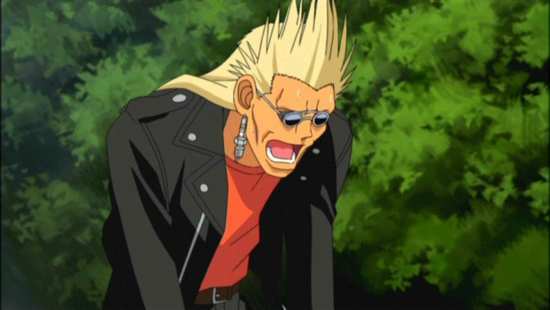 That's the end of the series proper, but like the first season, we get a couple of bonus episodes, the first sees a ghost mistaking Keiichi for his grandfather, and insisting he keep the promise that was once made, and Peorth returns for the final episode, determined to get Keiichi to tell Belldandy that he loves her. Urd agrees that Keiichi needs a good kick, he's worse than Hugh Grant in Four Weddings, but when Peorth's motivation and Urd's potions collide, chaos ensues. Season 2 has a strong start, and while its middle section is a little aimless, but entertaining nonetheless, it finishes very well, reaffirming Keiichi and Belldandy's relationship, before actually poking a little fun at Keiichi's hesitant nature and inability to commit. I enjoyed it almost as much as the first season, and didn't begrudge its episodic nature too much, especially as the majority of the stories were just as captivating. It really should have been out in the UK already, but with ADV still in limbo, there's no telling when it will ever arrive. Funimation have done a fine job in squeezing six discs worth of material onto four without apparently sacrificing quality. The cases are nice and compact and if you are as desperate for the Ah My Goddess fix as I am, then importing this set is a decision that pretty much makes itself. I hope they make more.